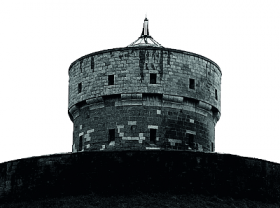 Millmount Fort is without doubt one of the most dominant features of Drogheda, sited as it is atop its great mound, and clearly visible from most parts of the town and the surrounding areas. One of many legends regarding the origins of the mound says that it is the burial place of Amhairghin (pronounced "Avarghin" - in English referred to as "Amergin"), the mythical Celtic inventor of poetry, but it has also been suggested that it was possibly a large passage grave like Newgrange. It was fortified as a motte by the Normans in the 12th century and a castle was later built on its summit. The fort offered Cromwell the strongest resistance he encountered during the siege of 1649. About 1808, the old fortifications were demolished and the present tower and defensive perimeter was erected. The fort was considerably damaged when it was shelled from the town by Free State forces during the civil war in 1922 and was finally restored by Drogheda Corporation. It has been open to the public since June 2000.On December 13th 2008 , two replica 8lb cannons were fired for the first time and a new permanent Military Exhibition opened by the Mayor of Drogheda , Clr Frank Maher . The view of modern Drogheda is also superb, if slightly more crowded than it was when Millmount was first fortified. The development of the town in its various stages may be clearly traced, from the 14th Century Magdalene Tower, to the 20th Century Lourdes Hospital. To the East, The Boyne Viaduct, a great feat of 19th Century engineering, which carries the Railway from the North into Drogheda, spans the river Boyne with graceful power.